Hanoi has said that Beijing had violated its sovereignty over archipelagoes in the East Vietnam Sea by sending missiles to an island and building a chopper base on another. China has also endangered peace, stability and freedom of navigation in the waterway, Le Hai Binh, spokesperson of the Vietnamese Ministry of Foreign Affairs, told reporters in Hanoi on Friday. “Vietnam insists that China stop such wrongful acts,” the spokesperson underscored. 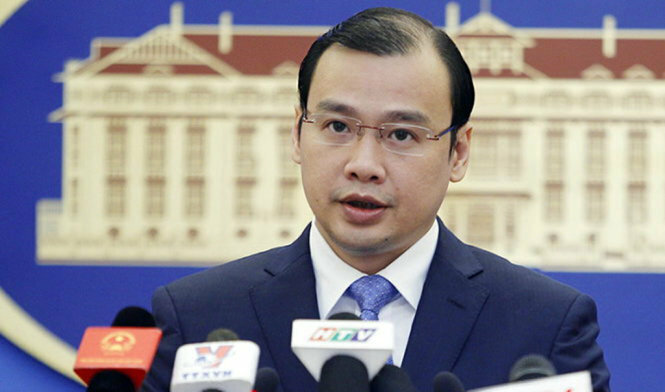 He added that his ministry sent a diplomatic note to the Chinese Embassy in Hanoi on Friday, protesting China’s infringement of Vietnam’s sovereignty over Hoang Sa. Vietnam’s permanent delegation to the United Nations also submitted a document to the Secretary General the same day, suggesting the official circulation of that diplomatic note. China has been found sending surface-to-air missiles to Phu Lam (Woody) Island, part of Vietnam’s Hoang Sa, with confirmation from the U.S. and Taiwan. Hoang Sa has been illegally occupied by China since 1974, when Beijing used force to seize it from Vietnam. Recent satellite imagery has also showed that China is working to build a helicopter base on Duncan Island, also belonging to Hoang Sa, that could be used for anti-submarine warfare missions. The international community has continually condemned Beijing for this militarization of the East Vietnam Sea despite Beijing’s vain bid to deny it. China claims nearly the entire sea through which more than US$5 trillion in global trade passes every year.